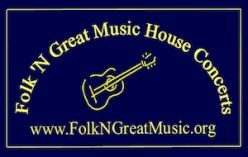 Welcome to Folk ‘N Great Music house concerts in Rockville, Maryland where you can enjoy talented musicians in an intimate, un-amplified, Metro-accessible, smoke-free listening room. Folk ‘N Great Music has been experimenting with a few new Rockville venues, where you can enjoy both local and nationally known folk and acoustic artists. 100% of the suggested per person minimum donation goes directly to the performers. Folk ‘N Great Music is proud to have been the very first unionized house concert series in the country with a Collective Bargaining Agreement with Local 1000’s American Federation of Musicians. You can learn more about it here.